On Thursday (April 17), NASA announced the historic discovery of Kepler-186f, an alien planet 490 light-years from our own world that is nearly the size of Earth and located inside the habitable zone of its parent star. The planet Kepler-186f was discovered by scientists using NASA's planet-hunting Kepler space telescope. The planet has a radius that is 1.1 times the radius of Earth, making it only slightly larger than our planet. Scientists have discovered Kepler-186f, the first Earth-size alien planet in the habitable zone of its host star. See how so-called 'Earth cousin' might have water, and possibly life. Scroll down for Space.com's complete coverage of the historic find of Kepler-186f. 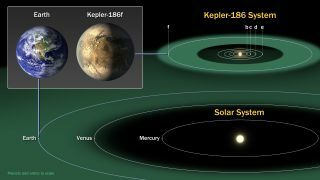 The rocky alien planet Kepler 186f is an Earth-size world that could have liquid water on its surface, and possibly even life. It orbits a star 490 light-years away. See the full details of alien planet Kepler-186f in this Space.com infographic. Scientists recently discovered an Earth-size planet in the habitable zone of its star. Here are five things to know about the new find. Next Up for NASA's Planet-Hunting Kepler Telescope: Finding Earth's True Twin? NASA's planet-hunting Kepler space telescope has just spotted Earth's cousin. Its next big find may be Earth's twin. Scientists have discovered Kepler-186f, the first Earth-size alien planet in the habitable zone of its host star. See how so-called 'Earth cousin' might have water, and possibly life. It's the brass ring that teams of astronomers from hither to yon have tried to grab: Discovering a planet that sports an environment similar to our own. Finding Earth's cousin. And now, a team of researchers may have done it. The five far-flung worlds most likely to host life as we know it, as determined by researchers at the University of Puerto Rico at Arecibo's Planetary Habitability Laboratory. NASA will announce a new discovery by its planet-hunting Kepler space telescope today, and you can following the unveiling live online. Space agency officials and scientists will host a live news teleconference at 2 p.m. EDT (1800 GMT).